The purpose of this little software it to capture regions of the screen into IrfanView – my favorite swiss knife image viewer. It can be used as either a standalone application that runs in the task tray, or as an IrfanView plugin (since version 4.25). The capture standalone puts an icon in the task tray. If the capture utility is not put in the place where the IrfanView exexutable is, you need to point it to the location of IrfanView. Right click on the icon and select Settings. Then enter the full path to IrfanView. To capture part of the screen press PrintScr and the icon will change to a capture cross. Move to the first corner and left click. Then move to the opposite corner and left click again. Press Esc or right click to cancel. The utility has two additional functions: measure a distance between two points and inspect the color under the cursor. Start these operations by pressing Ctrl+PrintScr and Shift+PrintScr respectively. You can also start them from the task tray menu by right clicking on the icon. The capture plugin is distributed with IrfanView since version 4.25. Activate it directly from within IrfanView’s capture dialog by selecting Options -> Capture/Screenshot… from the menu, or by pressing ‘c’. In the dialog select “Custom rectangle/region capture” and press start. You can also activate capture with the defined hotkey (Ctrl+F12 by default) or by pressing Ctrl+PrintScr. The plugin was integrated into IrfanView since version 4.25, so you don’t need to install it separately. If you want to use it as a standalone utility that runs in the task tray, just unzip irfanview_region_capture.zip to the folder where IrfanView is installed. 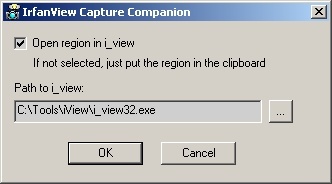 Actually you can put it anywhere, but then you need to point it to the i_view32.exe executable in the setting dialog. This software is free. It is distributed with the source code and you are encouraged to do anything you want with it. If you do anything interesting, I’d be happy to hear about it. The code is based on a capture gadget by DCUtility taken from The Code Project.